Being a plant leaf, it is available in plenty and is easily degradable. It requires very little cleaning and is easily disposable, meaning a huge family get together will not leave you with a pile of dirty dishes to wash for the next two days. Moreover, it is eco-friendly on all levels. It does not contain harmful chemicals or coatings, requires very little water for cleaning, and cuts the need for harmful dishwashing soaps; indeed a boon for a water-scarce country like ours! 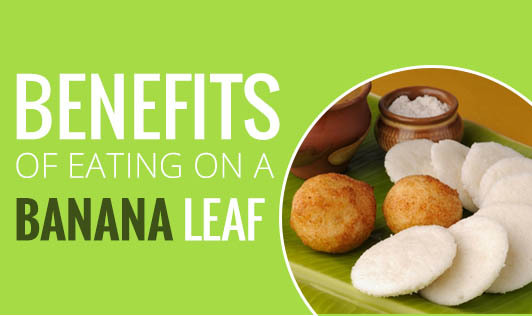 Eating a wholesome meal on a banana leaf gives you more health benefits than you can fathom. The antioxidant polyphenols present in them help fight cancer, and the polyphenol oxidase helps fight Parkinson’s disease. Banana leaves are also extensively used in traditional medicine such as Ayurveda. Plates and cutlery often contain a thin coat of dishwashing soap or detergent even after being washed and cleaned thoroughly. And these chemicals when ingested cause harmful side effects. This problem is completely eliminated while using banana leaves. They require very little water for cleaning and are especially more preferable while eating at places with poor hygiene. It serves as a practical solution for wanting to have everything you eat in a single serving on a single serving dish. What more does one need? You don’t need to confuse yourself with the different cutlery and try to match them with their specific purpose. Just load up your leaf and dig in! It is waterproof and perfect for serving liquid food items such as rasam, kheers, or kadi. Indian meals are large and moreover, not divided into specific courses. At weddings, we get served sweets, entrees, appetizers, main course, pickles, papads, and sometimes, even desserts at the same time. What better way to do it than to present it on a beautiful banana leaf. Not only does the colorful appearance give you pleasure while eating, it also saves time taken for serving each dish, and the number of serving rounds needed; especially during large events and weddings. Ever tried taking in the intoxicating aroma of something hot placed on a banana leaf? You should try it next time. Not just that; it improves the taste of certain dishes too. Finally, we love to follow the ways of our ancestors- especially when they are right! It is nice to have a bit of history and culture when you are dealing with something as fundamental as food. Our ancestors were sensible and efficient people indeed! And sometimes, isn’t that one reason enough? Let us get in touch with our roots and be part of that proud tradition.